This is the perfect location for families and couples who want the best of both worlds - mornings by the pool and afternoons by the beach. These apartments are close to to all the amenities of Playa d\'en Bossa, the waterpark and mini golf courses. Apartments well equipped with everything you need, only thing missing is a microwave. I never cook on holiday so not a problem for us though. The cleaners seemed to come round most days and linen changed once a week. The restaurant and bar is good and the food is lovely, they even serve a couple slices of toast with jam, marmalade and a tea or coffee for about 2.20 Euros right up to a full meal. The staff are very friendly and always courteous, making us feel welcome and nothing was a problem to them. These apartments are located about in the middle of resort, right near the fairground and straight off the pool area down a few steps is the beach. About 20 steps to the water's edge......bliss. We didn't really stay at the apartments at night but there was entertainment a few times that we know of, mainly singers, a hypnotist and a parrot show. We would visit here again most definitely if we decide to go self catering again. been to sal rossa seven times now thats why we go back year after year.staff fantastic .food good .going again this year cant wait. Before going to Ibiza i had heard a few bad reports, As it was mine and my best friends first time to the island i was very worried and i have no idea why. The rooms were amazing and very clean. They were equipped with all essentials for a self catering holiday. The hotel is located right on the beach and families we met up with were able to sit by the pool whilst watching their children play in the sand. Music is played for guests at the poolside but it isn't too loud so reading or sleeping is still quite easy to do. The bar staff Manuel and Jordi were amazing, so much fun and very entertaining. They really did have great customer service and we had lovely welcome. We only ate out for breakfast once and it was very cheap for the quality just 4 euro for a full breakfast and a coffee. The saftey deposit box was very cheap 26 euro for the week and we got 6 back when we gave back the key. I found all staff very friendly and manager was always happy to help. Entertainment was good when provided and many a night we ended up in the bar until god knows what time with Jordi and Manuel. Theres no such thing as an early night in Ibiza! Self-catering apartments, A great holiday except for the charges for air-conditioning and safety box, on arrival it cost 70euros for air-con and you do need it and 40euros for box. Great location on the beach front couldn't get closer if you tried. Great staff especially Geordie the barman, make you very welcome always having a laugh. Rooms clean but basic, only 2 cooking rings which were rubbish so we ate in the bar every mealtime, the food was delicious and very reasonable. Entertainment was good but only 2 or maybe 3 times a week, not much to do for our 15 year old daughter. Pool loungers were locked up on a night and if you wanted one the next day had to get in quick when they were unlocked at 9am. Make sure the miserable manager doesn't short change you when exchanging money or cheques, he did it twice to me so took hubby with me the next time and he counted it out on the counter in front of us. Would stay there again but would take more money or only stay for a week. This hotel is so under-rated!! Everything about it was perfect for the price we paid. 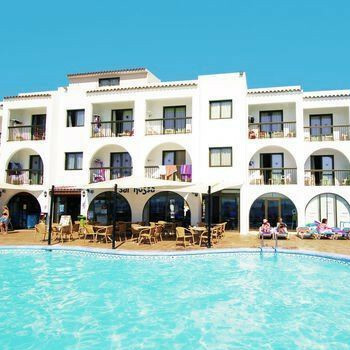 Its in an excellent location, right on the beach and close to all the local shops and bars. Rooms were cleaned practically every day and the hotel food was amazing and great value for money, as well as the drinks, (which in some parts of Ibiza can be very expensive. Overall, this was possibly the best place i have stayed and cannot understand why its only rated 1 star! This hotel is ideal if all you want is a beach holiday, or laying round the pool. The hotel staff especially restaurant and bar staff are excellent, very helpful and friendly. Althought the hotel manager lacked humour and failed to smile through out the whole 2weeks we stayed there, which is a real shame cause he lets the rest of the staff down, as they really try to make your stay there special. We were self catering and stayed in the hotel every breakfast as its brilliant value for money, 4euro for a full cooked breakkie with tea or coffee and trust me you couldnt cook better at home yourself. The brekkie consisted of toast, beans, egg, sausage and between 4-6 rashers of thick bacon (beautiful) some mornings I got fed up of chewing but you had to finish it ha-ha. I couldnt fault the food or service of this hotel, the cleaners were friendly and the apartments clean and well kept. With a beauitful view overlooking the sea if the resort had more to offer I would definately go back, but this is a very clean and family friendly hotel, once again shame about the miserable manager. I travelled to this hotel with my 2 children and my mother, the hotel was in a fabulous location but the resort itself was not family orientated. The food in the hotel was value for money (the cheapest in the resort for breakfast). But in all the resort is not family orientated. The rooms were very small, to accomodate a family of 4. there was not enough cupboard space for the amount of peaople ion the room. The maids were ok, but I found myself cleaning the room even after the maids had been in. e.g. (my son broke a glass in the bedroom and I was still finding glass under the bed 2 days later). The entertainment was poor considering it is suppose to be a family hotel, fire walkers, hypnotists. There was absolutely nothing for children to do in this resort. If you are looking for a peaceful holiday.don't stay at Sal Rossa! Piped music 12 hours a day, aircraft overhead on and off from 6.30 am until nearly midnight and the bin men calling at 4.30am. Not to mention the tractor cleaning the beach at 5.00am every day. OK, so we had a sea view apartment, which we great, but we could certainly have done without the constant noise. I should also mention the hotel's entertainment;again very loud and noisy, but if you enjoy karaoke and nondescript groups, then you'll be OK. We chose to go to Ibiza when we knew the clubs would closed, but suffered just as much. Now the good bit---the apartment was clean and had all you needed for a self-catering holiday, so long as you don't intend to cook much! The towels were changed every other day and the sheets twice a week;the staff were friendly enough and the breakfast from the pool bar was very good. Just up the road is a very good Chinese Restaurant which we highly recommend. Very pleased with the overall holiday at the Sal Rossa. Staff were friendly and helpful and were very popular with everyone staying at the hotel. Entertainment wasnt that good - the usual karaoke one night and a parrot show the next. I didnt expect a daily entertainment programme as the hotel isnt advertised as a family first hotel. Given the location of the hotel it was easy to walk onto the main strip for pubs/clubs etc including a few with family entertainment. The apartments were cleaned most days and the cleaners were always around even during the evening - I have never seeen that before! The apartments are spacious enough for a family of four and kitchen is big enough with the ususal cooker rings/kettle/toaster etc. There isnt a supermarket on site but one accross the road and another not too far away. Please be aware if you arrive in the morning dont expect your room to be ready until at least half twleve as the leaving guests do not have to vacate until noon. Expect to have to wait - this didnt bother us that much as we sat in the bar enjoying a glass or two of beer. Would definitely stay here again without a doubt.